Summertime always leaves me craving a daily does of raw veggies. Whether it’s a green leaf salad or raw veggie sticks, they make the perfect healthy cool down. To avoid boredom from eating the same veggies day in and day out, especially with my summer garden in full swing production, I like to keep a jar or two of my favorite homemade salad dressings on hand in the fridge. Some of these recipes I come up with on my own, but I also adore some other blogger’s inventions. Here are some of my favorites that always make me drool! Try them all and then let me know what you think. With these tasty drizzles ready to go in your fridge, you will be guaranteed to scarf down some extra veggies! 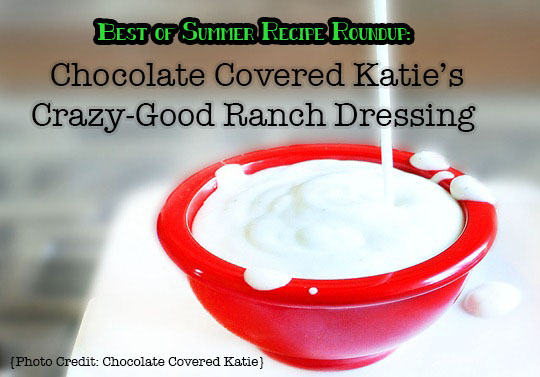 First up, Chocolate Covered Katie’s Crazy-Good Ranch Dressing. It’s cool. It’s a classic, and it honestly makes you want to track down the nearest veggie to dip in it. This one is tofu based, making it protein strong instead of the fat-filled dairy based original. This is the dressing I am currently obsessed with since ranch dressing especially reminds me of hot Texas summertime picnics. I keep mine ‘salad ready’ by storing it in an old sriracha bottle which you can see in this recipe round up header image. Here is Katie’s photograph. 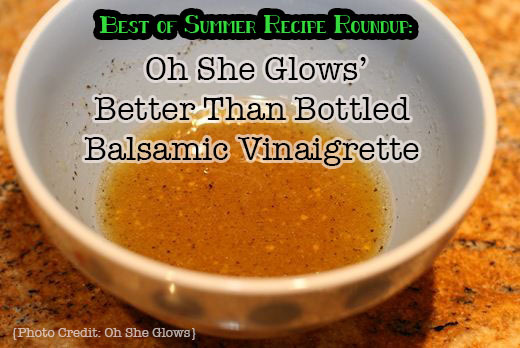 Another healthy version of a classic dressing is Oh She Glow’s Better Than Bottled Balsamic Vinaigrette. Sweet and tangy at the same time, this works especially well on greens with stronger flavors such as kale and arugula. 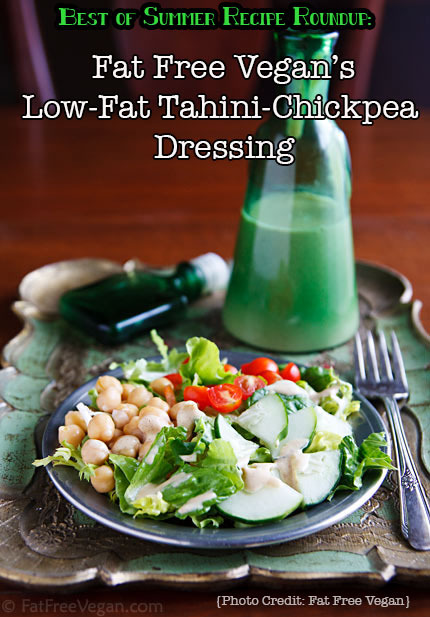 Fat Free Vegan’s Low-Fat Tahini Chickpea Dressing isn’t as well know as ranch or balsamic, but man it should be. I’m not sure whether the best part is the protein or the tasty. Okay, they are both really amazing features of this crowd pleaser. Even if this one sounds a little out side of your comfort zone, give it a try and I know you will be hooked. For variety and interest I enjoy making ethnic themed salads. 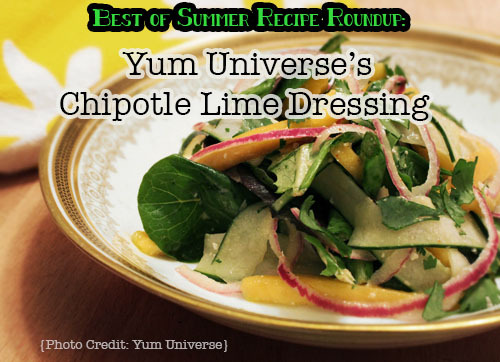 Try a latin themed salad using a dressing such as Yum Universe’s Chipotle Lime Dressing. This one is spicy but cooling and refreshing at the same time. Perfect for summer! Or maybe try an asian salad using The Simple Veganista’s Citrus Peanut Dressing. Excellent on a salad, but also nice as a spring roll sauce or tossed with cold soba noodles. Feeling adventurous? Use a julienne slicer to make thin ribbons of raw veggies such as carrots and zucchini. 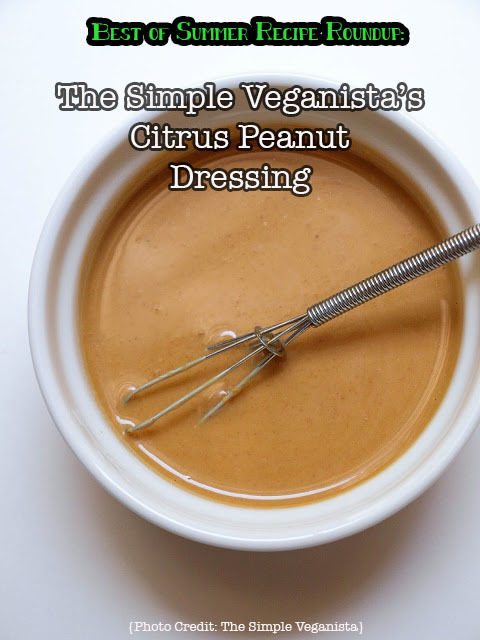 Drizzle with this citrus peanut sauce for a super good-for-you raw salad. Yum! 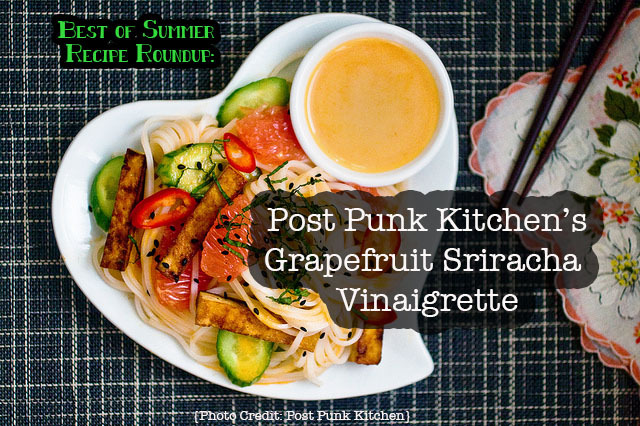 And for a taste thats hard to classify but impossible to ignore try Post Punk Kitchen’s Grapefruit Sriracha Vinaigrette. This fusion style dressing brightens up the most boring greens. So light and crisp, yet bold and complex. I know that makes no sense…until you try it. Here are some links to Vegucated Kitchen’s most popular salad and dressing recipes. Enjoy the Best of Summer and eat up those veggies! Don’t forget that salad dressings also don’t have to me a formal recipe. They could be fruit juices, hummus, sauces, marinades and condiments diluted to the right consistency. Try your own inventive combinations to suit your taste. Here is a basic rule to get started. Try a sweet element (agave, pureed strawberries, leftover pineapple juice once the fruit is eaten, etc) plus a tart or tangy element (mustard, vinegar, wasabi, hot sauces, etc). Mix and taste. Does it need more salt? Then add a dash of soy sauce. Is it too spicy? Dilute with a neutral liquid or a slightly sweet one such as ketchup. Keep in mind that it also takes only a relatively small amount of dressing to dress a big salad for the whole family so play around with a tablespoon of this and a dash of that. This entry was posted in Blog, Recipe Roundup and tagged best of summer, recipe roundup, salad dressing. Bookmark the permalink.